This wonderful and well-maintained home is on a quiet, family-oriented tree-lined street in highly desirable West Menlo Park ... between Santa Cruz and Valparaiso Avenues ... very close to Hillview Middle School. The residence is 2,598 sq. ft. in size which includes 1,903 sq. ft. of living area plus an oversized two car garage with a large storage area and built-in storage cabinets. The residence features: a large living room with fireplace and 9 foot ceiling; two bedrooms and two baths plus a separate one bedroom one bath au pair / studio suite with its own entrance; eat-in kitchen; wood-paneled family or dining room; laundry room; oak hardwood floors throughout most of the residence; and many closets. The master bedroom has a walk-in closet and French doors leading to a patio that receives morning sun. Appliances include refrigerator, gas stove and oven, dishwasher, disposal and washer/dryer hook-up. Perfect for entertaining, the very private and gated back yard features a flowering trumpet vine, wrap-around brick patio, outside dining/entertainment area and gazebo. 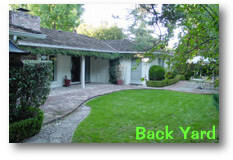 There are mature gardens and landscaping, front and back, with gardener included. 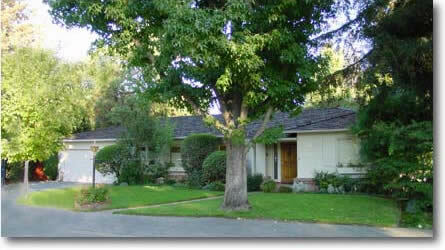 This home is located in the excellent Menlo Park school system. Oak Knoll (K-5) and Hillview (6-8) schools rank in the top 10% of all California schools on statewide Stanford Achievement Test scores. Its central location provides convenient access to downtown Menlo Park, Stanford University, nearby hiking and biking trails, Highway 280 and all Silicon Valley locations. One year lease. One month security deposit. Non-smokers only. Select pet types/breeds may be possible with additional security deposit.